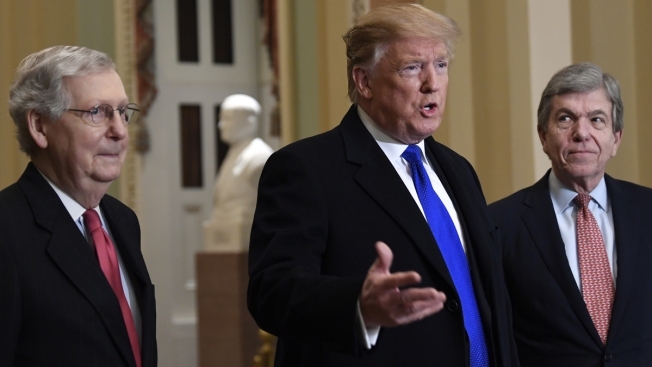 President Donald Trump accompanied by Senate Majority Leader Mitch McConnell of Ky., left, and Sen. Roy Blunt, R-Mo., right, speaks to members of the media as he arrives for a Senate Republican policy lunch on Capitol Hill in Washington, Tuesday, March 26, 2019. Senate Republicans on Wednesday used a controversial procedural tactic called the “nuclear option” to change chamber's rules to make it easier to confirm lower-level Trump nominees, NBC News reported. The effort, led by Senate Majority Leader Mitch McConnell, comes after Republicans failed to adopt a resolution to change the chamber's rules so that non-Cabinet level executive and district court nominations would face only two hours of floor debate rather than 30 before a confirmation vote. That resolution received only 51 of the 60 votes required for adoption, along party lines.